What Can Marshmallows and Self-Control Teach You About Your Child’s Future Success? Does your child struggle with self-control and impulsiveness? 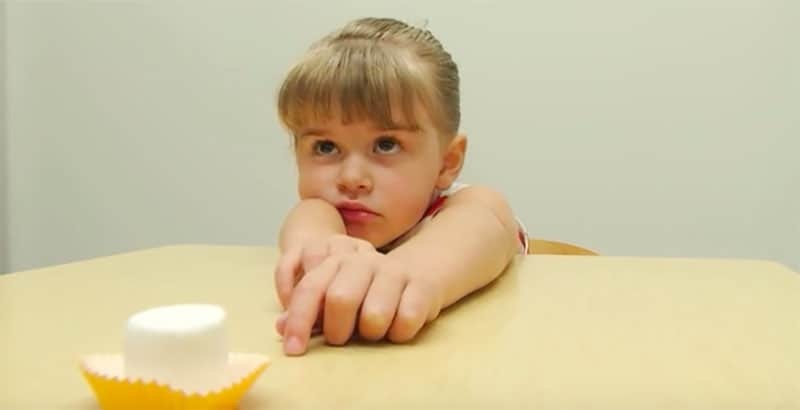 Can a simple marshmallow tell about your child’s ability to wait? In the 1960s, Stanford Psychologists conducted a study that had children select a treat, such as a marshmallow or cookie. The child was told they could eat the marshmallow now, or if they waited a few minutes, they could earn a second marshmallow when the adult returned to the room. The study has been imitated many times; you may have even heard about it, or seen videos online. If you haven’t, here’s a short video. The results of the study showed that children with the ability to demonstrate self-control, and delay gratification tended to have better outcomes later on in life, such as success in school and physical health. Aside from the entertainment of watching kids try to resist the urge to eat the marshmallow, there are practical applications for daily life. For many parents, teaching self control is one of the biggest challenges. It is a major life lesson and in Dan Siegel & Tina Payne Bryson’s book, No Drama Discipline, they outline strategies, such as mindfulness tools, to help enhance your child’s ability to practice self-control and resist impulses. One of those strategies is the hand-brain model. This model teaches children what is happening in their brains, and helps them to make intentional choices on how to respond. This is just one strategy that may help your child the next time they are tempted to make impulsive choices. As your child faces challenges, and as their brain continues to develop, parents can also teach this principle by modeling self-control with their own behavior. Talk to your kids the next time you face your own “marshmallow test” and show them how you use self-control. And, as always, make sure you catch them in the act of showing restraint, and let them know you’re proud of them-the results may surprise you.